The proof is in the pudding (and the boozy cake). The United States is one of the few ex-British colonies that never claimed the venerated holiday Boxing Day. Fools that we were! The day after Christmas is the perfect time for munching on leftovers, embarking on a massive jigsaw puzzle and enjoying a leisurely stroll in the park. True, we U.S. residents can still choose to loll around, holiday or not, but how much fun can it be if you have to sacrifice a vacation day? Wouldn't you prefer Dec. 26 to be a nationally mandated day off rather than subject to the whims of an employer? Had we been part of the Commonwealth, we, too, might have adopted the holiday. It's celebrated not only in Britain, but in Canada, Australia, New Zealand, South Africa, Hong Kong, Kenya, Jamaica, Bermuda, Guyana, Trinidad, Tobago and Barbados. Despite its name, the holiday has nothing to do with the sport. The origins of Boxing Day are hotly debated, but the most common guess is that Dec. 26 was the customary day in Victorian Britain when the manor servants, having waited on their masters all Christmas Day, would collect their yearly bonuses, gifts and leftover foods, delivered in boxes. I asked family members and friends who live in Boxing Day cultures how they spend the day. My British niece wrote, "We enjoy leftovers and walk the dog. Then our family usually has a good old sing-song and may watch a Christmas comedy on the telly." Another niece who lives in England starts the day with a homemade breakfast of "bubble and squeak" (a traditional British dish using fried leftovers of Brussels sprouts, cabbage, carrots, potatoes and meat). In Jamaica, my stepsister reported, "people continue eating and drinking with a picnic of Christmas leftovers on the beach. Plus, for 60 years, the Jamaica National Pantomime has opened on Boxing Day, so it's become a tradition for families to go to the theater." From Britain to Canada to New Zealand, Boxing Day has become increasingly commercialized. In New Zealand, according to a friend, "All the major stores have big sales and a lot of people leave their Christmas shopping until then to take advantage of the bargains." Since I'm married to a Brit, our custom has been to celebrate Boxing Day by hosting a gathering in honor of Barry's roots. I prefer inviting people over after Christmas rather than competing with all the social events that crowd the week before. In honor of the occasion, I make traditional sherry trifle, a layered dessert that I learned from my late Welsh mother-in-law, Eluned Davies Evans, known as "Lyn." Lyn had many sterling qualities, but culinary sophistication was not one of them. The ingredients in her sherry trifle are not what you'd call "foodie." When guests ask what's in the trifle, I change the subject, but if you must know: yellow cake mix, canned fruit, and custard (occasionally even instant). Despite the humble ingredients, the combined outcome is nothing less than delicious, something to be savored. I'm told the longer it sits around, the better it tastes, but mine has never lasted long enough to test that theory. 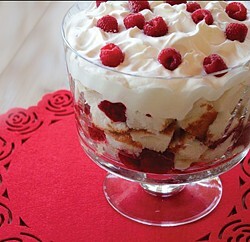 The U-shaped structure of a trifle is always the same: down in the valley of the bowl (preferably glass, the better to see the layers), you assemble cubes of cake, coated with jelly and moistened with sherry; in the next striation, cut fruit and custard, and finally, crowning the top, a thick blanket of snowy whipped cream. You could, of course, go the gourmet route and make your own pound cake and custard from scratch. Despite pangs of disloyalty, I do prepare my custard at home, but otherwise continue to show respect for the dead by following my mother-in-law's hallowed methods. Prepare and bake the pound cake according to package directions, then leave it to cool. When the cake is cool, spread the jelly over the surface of the cake. Cut the cake into cubes and arrange them along the bottom and sides of a glass serving dish. Moisten the cake by sprinkling it with the sherry or brandy. Arrange the cut fruit on top. To prepare the custard, whisk the eggs, milk, vanilla and corn starch in a medium saucepan over medium heat. Whisking constantly, bring the pot to a boil and simmer for 2 minutes. Whisk in the sugar and continue whisking until it thickens. Set it aside to cool. Once it's completely cool, spoon the custard over the cake and fruit. Chill for several hours. Whip the cream and chill it. 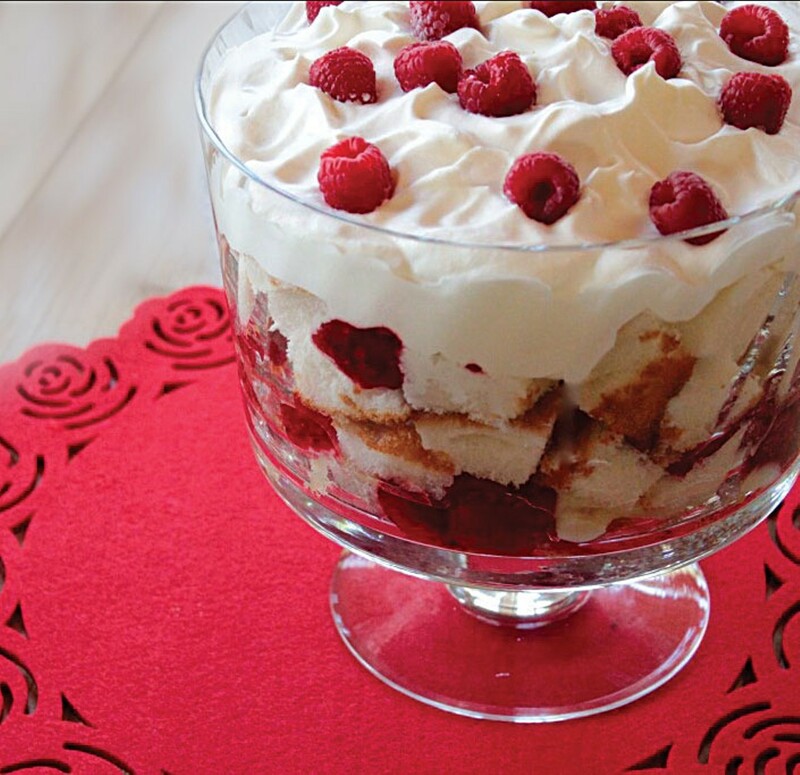 Just before serving, top the trifle with whipped cream. Garnish with more fruit if desired. Louisa Rogers can never decide whether her favorite inherited recipe is her mother-in-law's sherry trifle or her grandmother's frozen cheesecake. Good thing she doesn't have to choose.